To make the Parmesan fritters, add the milk, butter and 100ml/3½fl oz water to a saucepan and bring to the boil. Immediately stir in the flour and mustard powder and beat together. Remove from the heat, leave to cool a little and beat in the eggs, thyme and 100g/3½oz of the grated Parmesan and all the cubed Parmesan. Carefully add the fritters to the deep-fat fryer and cook until golden and crisp. Remove using a slotted spoon and drain on kitchen paper. For the spinach, place all the ingredients in a saucepan and cook until the spinach is wilted and the cheese melted. 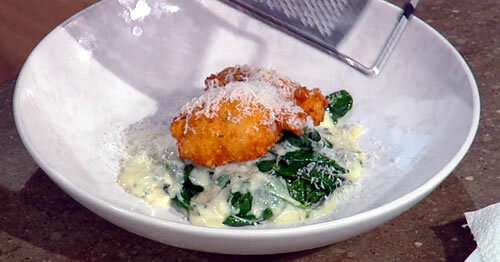 Spoon the spinach onto warmed plates, top with the fritters and sprinkle with the remaining Parmesan.